Carpal tunnel syndrome is a condition produced by the squashing of the median nerve as it passes through the wrist. The symptoms usually affect some or all of the thumb, index, middle and ring fingers. The little finger is not involved. The median nerve supplies sensation to a large portion of the palm and moves some important thumb muscles. 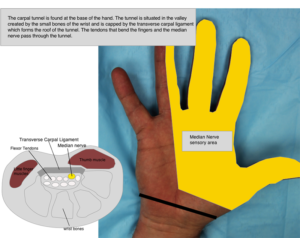 To get in and out of the hand the median nerve has to pass through a tunnel at the base of the hand. It does so in the company of 9 tendons which function to bend the fingers. The tunnel is a fixed size. It does not get bigger as we get older but unfortunately the tissues in the tunnel thicken. In many then the space ceases being big enough and the contents of the tunnel get squashed. While the tendons don’t mind getting squashed the nerve does not do well. Its blood supply gets reduced and hence its function starts to be disturbed– initially producing tingling but eventually shutting down to the point of numbness. In more severe cases it can produce pain that tracks up the nerve resulting in aching up the arm. If an underlying medical problem is suspected then this needs appropriate investigation. Simple pain killers, a splint to hold the wrist straight at night and steroid injection into the wrist to decrease swelling are often used in minor cases or cases that are thought due to medical reasons – eg. If you are pregnant or have an underactive thyroid the problem may well subside with the baby’s birth or medical correction for the thyroid and so treatment is designed to ‘buy time’, relieve symptoms and minimise underlying nerve damage until this can be achieved. If symptoms are severe, the history is lengthy and you are over 50yrs it is likely you require a carapl tunnel operation. In this situation an injection often only delays the inevitable – ie. the need to make the tunnel larger and so relieve the pressure on the nerve long term. This is achieved by operation. The carpel tunnel surgery is called a ‘ carpal tunnel release’ operation, or ‘carpal tunnel decompression’. It is achieved by dividing the ligament which forms the strong roof of the carpal tunnel. This allows the tunnel to ‘open up’ in the same way as releasing a tight belt when you have eaten too much releases the pressure on your belly. This can be performed under either local or general anaesthetic.